Fredericksburg, Northern Neck and Middle Peninsula areas of Virginia Farmer's Markets: Find a local farmer's market near you in Fredericksburg, Northern Neck and Middle Peninsula areas of Virginia for fruit, vegetables, pumpkins, organic foods,local produce and more! Looking for a local, true farmer's market in Fredericksburg, Northern Neck and Middle Peninsula areas of Virginia? 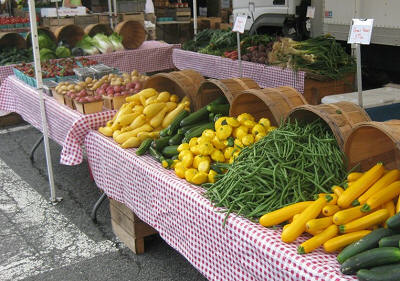 Scroll down this page and you will see the farm markets, farm stands, roadside stands, produce markets, even garden fruit and vegetable stands and seasonal community farmer's markets in Fredericksburg, Northern Neck and Middle Peninsula areas of Virginia, sorted by county. Markets offering organic or sustainably grown produce are identified by the words "organic" and/or "sustainable" in Green, next to their name. If they have a website, the name will be in blue and underlined; click on it and it will open their website. Comments from a visitor on July 12, 2011: "Excellent. First visit this weekend & would highly recommend it. We went for U-pick blueberries & blackberries, both of which were available this past weekend. Also have nice farm market., restrooms, picnic area. Not organic, but sustainable. I think they do holiday themed events. 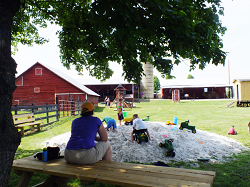 A lot of detail on their web page & on Facebook"
Comments from a visitor on August 02, 2009: "My husband and I went picking at Pleasant Fields Farm this morning. Blackberries were plentiful, and raspberries were just beginning to come into season. Blueberries were advertised, but were picked clean. The farm is open from daylight to dark. Today (a Sunday) it was operating on the honor system, and cash or checks could be left for payment. There was a nice farm stand with lots of produce pre=picked: watermelons, corn, butternut squash, zucchini, acorn squash, eggplant, apples, oranges, peaches, cucumbers, onion, tomatoes, a variety of potatoes, lemons, limes, and fresh honey. I don't know how much of it was local (the tomatoes and honey definitely were). No fresh cut flowers available, but we weren't looking for them anyway. There is a restroom available."